Back-to-Backs were once the commonest form of housing in England. Built in rows or courts or blocks, the back-to-back was home to the majority of working people in Victorian cities. Though there were half a million of them, they have almost entirely vanished from the urban townscape. The miraculous survival of one single court in the middle of Birmingham, now owned by the National Trust and open as a museum, is the starting point of this book. The author, a widely respected historian, uses a mixture of documentary evidence and oral history to uncover a fascinating corner of our common past and tell the story of the folk who lived in Court 15. Such people are in all our family trees; but each is unique - a glass eye maker from Birmingham, a Jewish watch-maker from Poland, a tailor from St Kitts, and a little girl who used to sleep in the entry. They, and others like them, tell the story of life in 19th- and 20th-century Britain, in good times and bad, from the boom years of Victorian expansion to the Hungry Thirties and since. Dr Upton does not confine his narrative to domestic housing and demographic development. In his inimitable style, he explores such practical matters as: What was it like to live in a house with only one bedroom and no running water? Where did the bugs come from? And how did eleven families share two toilets? But, greatly widening the interest and importance of this book, Court 15 has another tale to tell - of where people live and why they live there. Why did the population of Britain move so readily into cities in the early 19th century and move away just as rapidly in the 1960s? 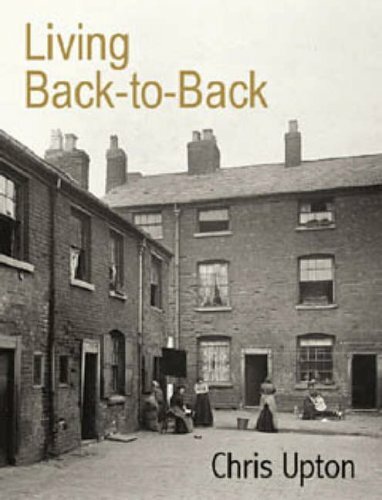 At a time when finding a place to live is once again a big issue, the rise and fall of the back-to-back is a sobering tale of how England houses its people. Thus the book has much wider than local appeal and interest, using, as it does, the history of Court 15 to illuminate the development of urban housing.